Happy Monday to you! I am currently writing my post on Saturday evening, since my Husband has fallen asleep on the couch watching NASCAR and I am kind of bored. This evening, I opened my crisper drawer in the fridge looking for veggies to dip into TJ’s newest dip, Guacamole Greek Yogurt Dip. I have to say I never got around to trying it because when I looked at my veggies, they looked sad. I didn’t want to waste them and I knew I couldn’t eat them all, so I decided to cut them all up and throw them in a bowl with some balsamic salad dressing and roasted them in the oven. It is a strange medley of vegetables such as peppers, onions, zucchini and a couple Brussels sprouts. I actually had three Brussels sprouts in my crisper. Who has three? Once I got on the roll, I had some potatoes that started to get eyes, and I don’t like their eyes looking at me, so I cut them off and tossed them in some olive oil and salt & pepper. I figured since I was cleaning up the fridge, I ended up taking everything out and cleaning the shelves and re-arranging everything. My middle shelf is normally where I keep my drinks, not anymore, I put fresh-cut up fruit, vegetables into bowls so I can grab them when I get hungry. If there in my face and ready to be eaten, I know I will eat them. This is a great way to stay out of pantry. If everything is there for you, no preparation needed, people will eat them!! As a reward for myself I made myself this. 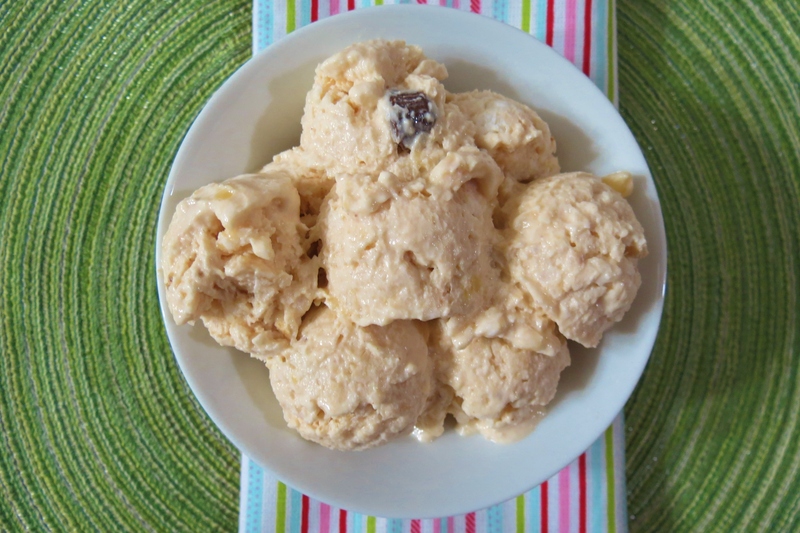 This is my copycat recipe of Ben & Jerry’s Banana Peanut Butter Greek Yogurt. When I was in Las Vegas, the New York New York Casino has a Ben & Jerry’s stand and I saw the Banana Peanut Butter Greek Yogurt and I had to have it. It was creamy delicious! I was tickled pink when I saw it in my grocery store. The calorie counting, label reading freak that I am, I made the mistake and read the label. Clean Up in the frozen food isle!!! A lady passed out, get her out of here! Yes, I just about passed out when I saw the stats of the frozen yogurt!!! Not pretty!! You know the mini little cups they sell, those really, really tiny ones. Well, B&J’s frozen yogurt was 200 calories for that! I must have ate about 4 times that in Vegas! Why do they call it greek yogurt? It’s not healthy! Sorry Ben and Jerry, but I can’t eat this, no matter how good it is!! Now don’t get me wrong I love Ben & Jerry’s, but I am yet to find a flavor that is even remotely close to semi-low calorie. So I decided to make my own! Now does mine taste like B&J’s? I don’t remember! I do know that my frozen yogurt tastes amazing!! It’s sweet, has little chunks of banana and as a treat I threw in a few mini peanut butter cups in it. I love my frozen yogurt!! I also like that mine maybe just over 200 calories, but I do know mine is healthy!!! It is made with Chobani’s Greek Yogurt, has fresh banana’s and for the peanut butter I used PB2 Powder. I don’t care for PB2 powder by its self, but mixed in with other things it’s pretty darn good!!! If you don’t have PB2 Powder, you can use regular peanut butter. I debated about doing that, but went with PB2 since I had my hand in the PB jar this morning!! 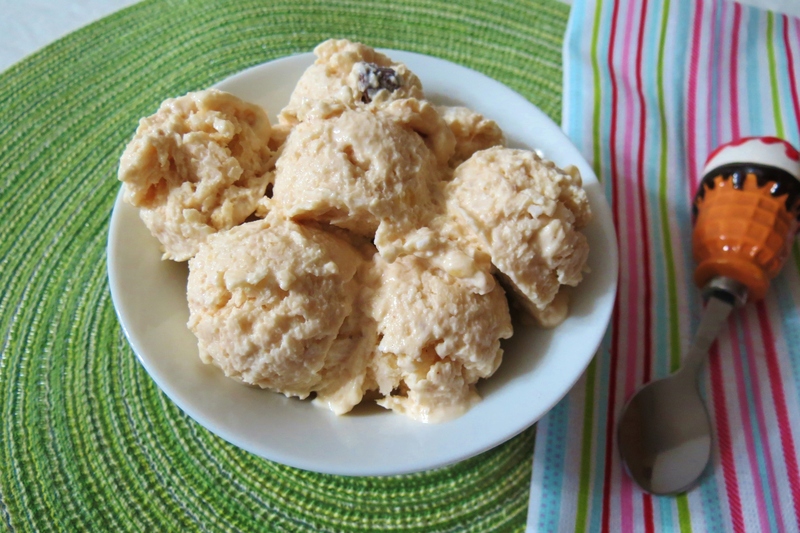 This yogurt is super easy to make, I just mixed everything together and placed it in my freezer for one hour. 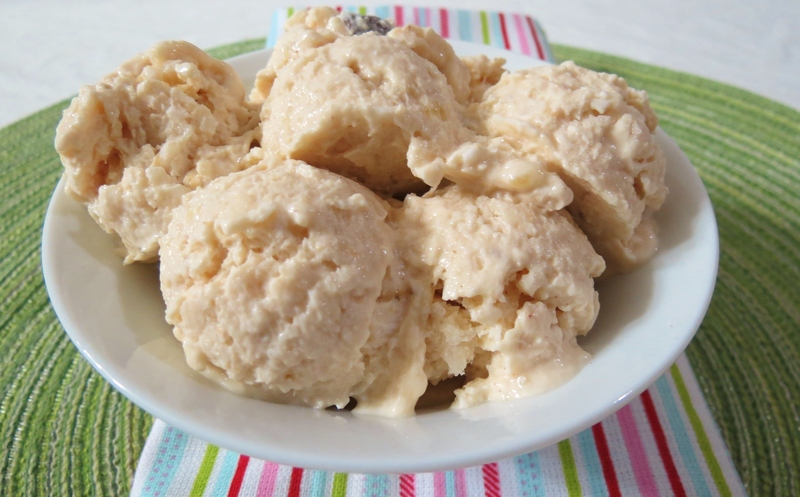 Out came cold, creamy, sweet, peanut butter ice cream!! Yummy!! Now this was a great reward for cleaning the fridge! I think I need to do this more often!! You know I like to do my comparisons so lets see how we compare to Ben & Jerry’s. So you may notice mine is higher in calories, but mine is more than double the size, plus mine has fiber and lots of protein! The sugar is low to! This is natural sugar due to the banana. I’m pretty happy with mine! All healthy!!! B&J’s has sugar labeled 3 times in their frozen yogurt! Yikes! Creamy, sweet, healthy frozen yogurt made with fresh banana's, peanut butter and mini chocolate peanut butter cups. In a small freezer safe container, add yogurt, vanilla extract and stevia. Mix until incorporated. In a small bowl add your PB2 and water, mix until incoporated and pour into yogurt mixture. Mix until combined. Add banana and peanut butter cups. Mix until combined. Place in freezer for 1 - 1½ hours until frozen. Mix will with a spoon. Scoop into a bowl and enjoy!! If the yogurt is really frozen, leave on the counter to thaw out for a few minutes. I really, really, really love having my yogurt this way! I have my frozen yogurt almost every night for dessert! I haven’t bought any ice cream/frozen yogurt since I discovered this! This is such a healthy way to get your protein in! I don’t know what I would do in a world without yogurt! It’s probably one of my favorite things ever! I eat it everyday!! I think I maybe slightly addicted! I incorporate it into so many meals. My family always asks, did you put yogurt in this? My Husband is not fan of yogurt at all. I don’t know why? I think he’s weird! Do you like yogurt? Whats your favorite kind? Time to fold laundry then go to bed! Have a great week! Ooooh! That looks really really good! I eat a ton of greek yogurt, mostly plain with fresh fruit chopped up and added. I run a lot so I love getting that healthy protein in! I am a greek yogurt freak! I swear I could eat it at every meal!!! I love it with freshly chopped fruit and PB!! It’s my favorite combo!! That looks fantastic! I will definitely try this recipe. Do you think I could use Better N Peanut Butter instead of PB2? Would I just use 2 TBS of it instead? Thank you so much. I think Better n’ Peanut Butter will work too! I’d use 2 tablespoons of it!! I hide my mini pb cups in the fridge so I don’t eat them!! Way back in the fridge!! I currently have TJ’s jalapeno cilantro hummus sitting in my fridge with no good veggies to eat it with either! Need to get on that. Ben and Jerry’s ice cream always makes me so sad because the nutritional stats are AWFUL. I’d much rather have your froyo! I LOVE Trader Joe’s jalapeno cilantro hummus!! It’s my favorite one they carry. I know about being sad about B&J’s ice cream. It’s so good, but the calories just kill me. It would be fine if I could eat one serving, but I can’t! Love this! Always adore a homemade version of a fav! Me too!! I like that I know what I put into my foods rather then store bought! Impressive-your versions are always the best 🙂 This dessert looks divine. And would hit the spot any time! Thanks Laura!! I just love this little dessert! At least making it at home you can control the portions and you have to wait for it ti freeze. Have a pint of B&J’s in the house is WAY to dangerous for me! I would love to try this. I actually wasn’t too impressed with this flavor from Ben and Jerry’s because I thought it was too sweet and too banana-y. THANK YOU!!! i just made your recipe, but with agave syrup instead of stevia and with Laura Scuttle’s natural penut butter instead of the powder. I’m waiting for it to freeze, but the batter was excellent. I fell in love with Ben & Jerry’s banana penut butter Greek frozen yogurt, but like you — I was horrified by the calorie count. Also, I thought it would be better without sugar and more bananas. I’m so glad you liked it before you froze it! Hope it turned out ok for you! I love not adding extra banana’s!! This is a fun treat!!! 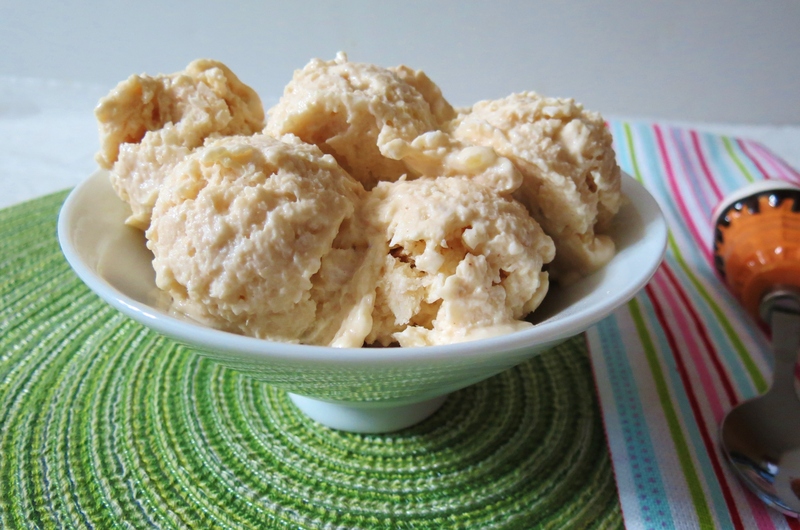 I bet making little peanut butter balls, freezing them and putting this in this would be good, kind of like raw peanut butter cookie dough!! Now I want to make this!! 2nd time I’m making your fabulous recipe. except I use half-stevia and half agave and natural penut butter (not powder). B&J’s is ridiculously unhealthy and I love that I can control the sweetness and amount I make each time. I love this recipe. It look to me delicious and awesome. Surely will try at this weekend. Keep sharing recipe like this. Thank you. Oh my gosh, that sounds like a great idea. I have never tried that. I have frozen greek yogurt before, so my guess is the PB 2 in it will be good. But one thing I learned is only freeze your yogurt for about an hour to get a nice consistency, otherwise it will become rock hard. 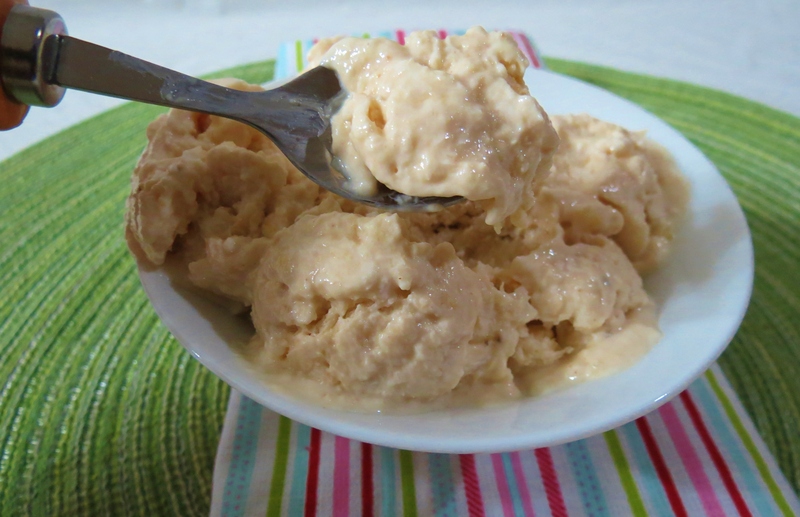 Just mix it with a spoon and you have an ice cream creaminess. it worked 🙂 (i’m just not a banana fan). I just mixed it every 20 minutes with a mixer so it wouldn’t turn into a frozen block like you said. I was dating this girl in Portland, OR (5hours north of my home) for about a year a few years ago. Well there was this Ben & Jerry’s a few miles away that we would frequent every week after a doctor appointment I had. 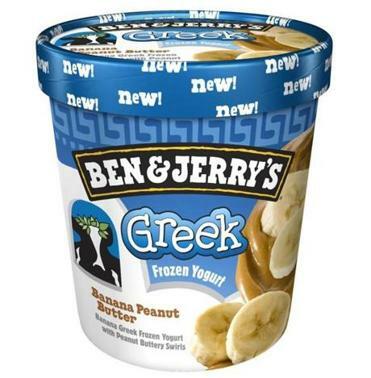 Well, one day I discovered this PB & Banana Frozen Greek Yogurt whilst searching for a flavor to order. Loving all those ingredients, I got a two-scoop cup; not enough. So before leaving, I ordered two of those, what are they, pint containers full of this insanely amazing frozen confection. They packed the cups and I took them home. Well I developed what some might call an “addiction”, and I HAD to have my girlfriend dish it up and hide it because I could and WOULD easily eat the whole cup in a sitting and it was giving me a bit of a belly. But the belly was so worth it just to have this food of the Gods melt in my mouth and slip down my throat. Well one day, we went to B&J’s AND THIS FROYO WAS GONEEEEEE!!!! They DISCONTINUED it!! So I have spent three long, rough, anguishing, cynical, and depressed sugar years miserably praying that God return this amazing treat back to me. BUT NOW MY PRAYERS HAVE BEEN ANSWERED!!! I now have the RECIPE and the FROYO at last! So thank you, oh, so, SO very much! You deserve to be declared a SAINT! Grazie!